Want the kind of traffic that boosts conversions? It all begins with the right key phrase. Leverage the long tail phrase. [Click To Tweet]. Can you tame a hummingbird? [Click To Tweet]. James Schramko here with a SEO news update. Focus on the long tail. What is a long tail? It’s a phrase. It’s a multi-part keyword. How do you find these? Well, there’s certainly some free tools you can use. One is Google Analytics. It will show you what phrases people use to get to your website, in some cases. Some of them are hidden, but what you can do is actually drill down into the landing page and see what the landing page is, and that’s going to give you some clues. But also Google Webmaster Tools. It shows you the type of words that your website is actually showing for in the search results, and the click-through rates, so you can see if it’s relevant. We can also go to other places. You can have a look at places like forums and see what questions people are asking. You can go to Yahoo Answers. You can see what sort of questions people are asking there. You can go to Wikipedia and have a look at the categories and sub-topics of major categories. So if you were in the baking industry, then you could go and have a look at all the different variations of the way that people describe the categories, the equipment, and the words that relate to that industry. You can also type your phrases into Google and see what pops up at the bottom of the page as a related search. And of course there’s numerous paid tools like SEMrush and Ahrefs and MajesticSEO. There’s also Wordtracker, and the Google Keyword Tool that’s kind of hidden now in the Adwords account. So, once you get these long phrases make posts with those phrases. And those posts are going to drive traffic for people who are really interested in that kind of topic. People do sit there at Google typing in questions. 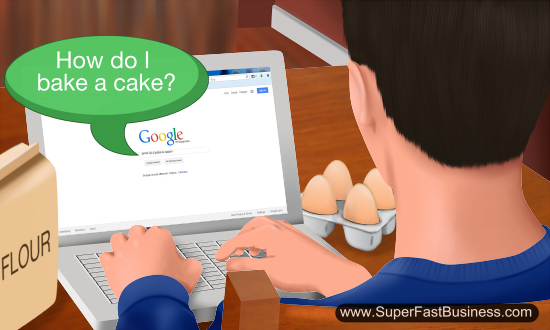 “How do I bake a cake?” “What sort of fuel does a lawn mower use?” All of these sorts of questions are going to relate to someone’s search, and a lot of those searches could result in a lead or an inquiry or a purchase for you. So go for the long tails, they’re easy pickings, you can dominate an industry just by having all of the long tails that people search for. So think a little bit outside the square. In fact, even run the recorder next time you’re talking to a customer, and listen to the words they’re saying. That’s what your posts need to be about. You now have the fundamentals that will be required to create an ongoing content campaign. So I hope that’s useful. I look forward to hearing about your successes. I’m James Schramko, catch you again soon. Nice James – I like your Wikipedia angle for finding long tail keywords…I hadn’t considered that before. I also like the Wistia player you’re using – the call to action at the very end of your video looks more ‘slick’ then the old Leadplayer CTA. Overall it just looks more ‘elegant’. I contemplated it. Probably I will. I used to like that with Leadplayer. The clickbable link is still quite stylish though…. James,should we be building links to pages like was once common? Or should we just be getting out lots of great content? You bet! Links can elevate your power. Trust, real visits and exposure. Infographics and guest posts on other blogs are great proof of the power of getting links. Great post James and loving the tee-shirt colour! Similar to Michael I had not thought about Wikipedia. Great tip.